39,300 new and resale home transactions closed escrow in California during September 2016. In step with the seasonal sales cycle, this is 10% below a month earlier when 43,700 sales closed. Further, the number of homes sold in September 2016 was 3% below a year earlier, amounting to 1,200 fewer sales. 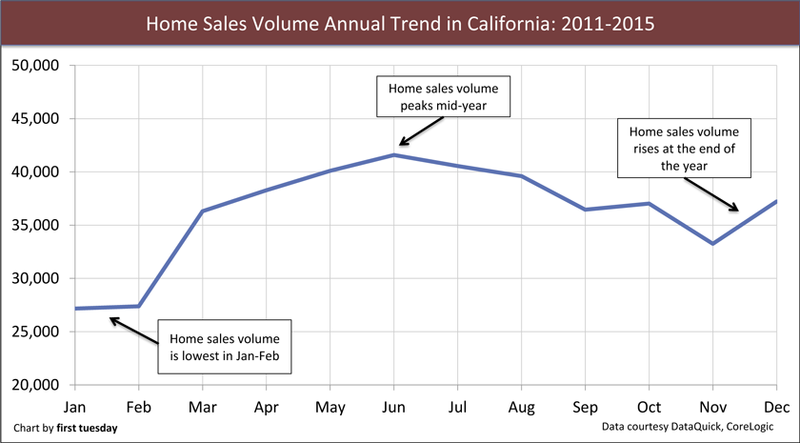 2015 ended with 450,700 home sales in California. This is 35,400, or 9%, more sales than took place in 2014. This is just above 2013 sales volume. For perspective, the number of homes sold in 2015 is still 303,203, or 40%, below peak sales volume experienced in 2005. The number of homes sold year-to-date shows a small, 1% increase over 2015 as of September 2016. However, this percentage has steadily decreased in recent months, and it’s likely 2016 sales volume will end level with or below 2015. Updated November 3, 2016. Original copy posted March, 2009. Chart 2 shows average home sales as experienced from 2011-2015. As depicted, the most homes are regularly sold each year in June. Another small increase takes place in December, as homebuyers seek to wrap up their financial activities before the end of the year. 2016 will initially see sales volume increase, but when FRM rates jump, likely mid-2016, sales volume will slow, ending the year flat to slightly up over 2015. 2016 home sales volume is just 1% above 2015, year-to-date, as of September 2016. This is well above 2014. However, the year-to-date percentage has steadily decreased in recent months, and when the trend continues it’s likely 2016 sales volume will end level with or even below 2015. Further, as of Q2 2015, 7% of California mortgaged homeowners were still underwater. Thus, turnover by this chunk of owners is restricted. These homeowners cannot sell and relocate to purchase another home because their homes are worth less than the debt encumbering them. To rid themselves of the home and the debt, they have to endure damaged credit resulting from a short sale or foreclosure. The desire to avoid this embarrassment takes most of these 7% homeowners out of the home buying market for years.